Very good, fully equipped--and clean!--communal kitchen. The WiFi is strong and there are ample sitting areas. Unlike many dormitories, this room was large & spacious and I slept comfortably during my stay. Easy check-in/check-out. An okay stay at the hostel, the place is clean and the room was quite spacious so it does not feel cramped and the staff is friendly and international. Good budget alternative. The lobby/common areas are very clean, homey, and comfortable! The staff were incredibly nice and helpful. 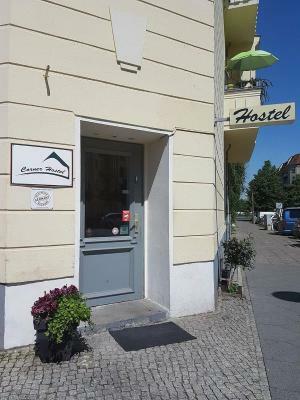 The hostel is relatively easy to find, close to S-Bahn station. Good neighbor with lots of restaurants, bars, and supermarkets. The hostel is at a quiet neighborhood, so no noise on the street during the nighttime or weekend. Shopping is quiet easy. Staff is very nice and there is always fresh coffee! Super friendly staff, not too loud, clean bathroom. One of our best sellers in Berlin! Guests are offered shared and private rooms at this conveniently located hostel. Surrounded by bars and only 3 minutes from the local train stop, Corner Hostel offers free WiFi, bike rentals and a 24-hour front desk. 30 minutes from the hostel, Berlin Main Station provides regional and international connections. Berlin Tegel Airport is also only 6.2 mi away. When would you like to stay at Corner Hostel? Featuring basic, modern furnishing, this private room comes with a shared bathroom. Featuring basic, modern furnishing, this bed in a shared room comes with a shared bathroom. Area Info – This neighborhood is a great choice for travelers interested in atmosphere, convenient public transportation and culture – Check location Good location – show map Guests loved walking around the neighborhood! House Rules Corner Hostel takes special requests – add in the next step! Please note that all rooms come with a shared bathroom (except the apartment). Guests are asked to either bring their own bed linen and towels or rent them on site. Sleeping bags are not allowed. LIDL in 5 minutes of walk. Nice student staffs. Hot water. Offering tissues in toilet! Big kitchen with a lot of tools to use. Cleaner everyday. Enough spaces in room. Tram right outside the hostel. Nice and quite place but also many places around to reach. The staff was very rude. Apart from the location nothing else was good. The lady sitting at the reception was very rude and was not at all helpful. It is a simple hostel, for the price it was a very good stay. No complaints to be honest. None come to mind. Extremely nice staff, like never seen by me before. Also a very cool and relaxes atmosphere was always present. One lady on the staff was especially nice and always caring that extra bit to help out others, or make their stay more comfortable (she will know who I have in mind) . I am very satisfied I found and used this place. The lot of the workers and/or guests were Hispanics and they tended to be loud and raucous when together, even when 'talking' on the Handys. wifi didnt reach the rooms. energy at the hotel was very depressive. i said i worked online and needed internet in my room and this accommodation did not suit my needs and was denied refund or cancellation as well as disrupted my business. is a far walk from tram stop and without much happening within a 20 minute walk. overnight receptionist slept on the couch. cash only so had to make extra trip to atm. building was very cold noisy and locks old and difficult. weird communal key system. mattress was old and springs kept poking into my back and was difficult to sleep. kept waking up multiple times from noise and being so uncomfortable (i had a private room also). bed sheets had holes in them and i was not given a towel even after paying an extra €3 for linens so had to air dry in the winter in freezing drafty building. worst hotel experience in berlin so far and ive stayed at many. The staff was very friendly. It was clean and comfortable. Just a bit of facelift needed especially during the winter to improve heating. But overall ok. The staff are super nice. Nicest I ever met during my many travels. I had a comfortable bed, the shower pressure was great, also hot water, pretty clean kitchen. Toilet paper was available. And you can come in and go out when ever you want.